That is actually a Spiriferid brachiopod. They are a very common find in some Devonian areas, like upstate New York. They are known to be an Index Fossil of the Devonian. Good call - looks like your righto!! 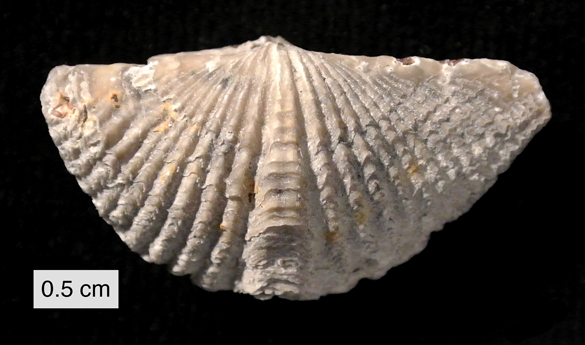 Spiriferid brachiopod, I have many of those in my fossil collection. Here is one of mine from Central NY and that's another one in my avatar. The one you have is an internal mold which means the original outer shell dissolved at some point. 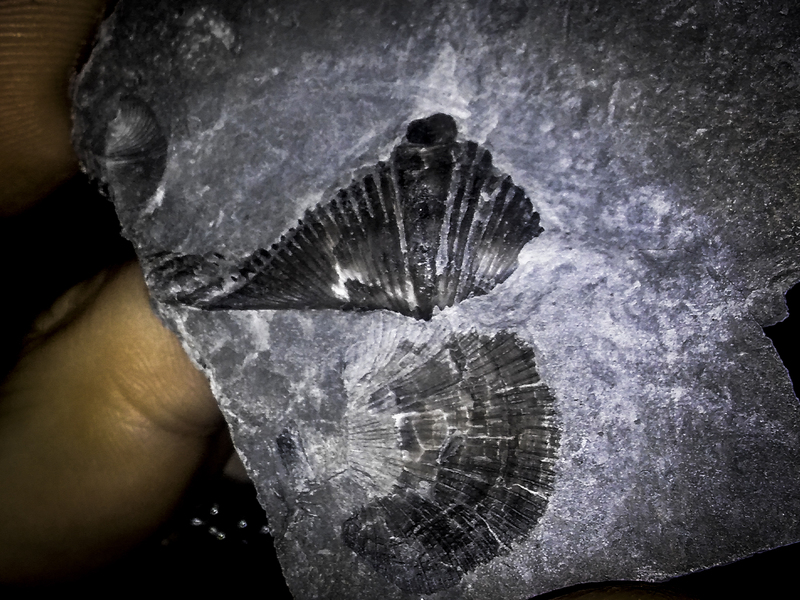 Mucrospirifer brachiopods are found in Middle Devonian sediments of NY's Hamilton Group and in Pennsylvania's Mahantango Formation and in sediments of the same age in some other neighboring states and provinces. Yes it is! I don't know why I didn't bother to mention the mold part :/ Thank you @Jeffrey P for clarifying that! Would these have been hinged up the middle like a "Butterfly scallop". If so the closed creature would have been triangular??? Not sure if I know what you're saying, exactly. They were hinged shells, but the symmetry of brachiopods is different from that of pelecypods. Brachiopods were symmetric (looking at the shell from above) side to side, whereas pelecypods were symmetric from front to back. Here are pictures of Mucrospirifers in different orientations. EDIT: Ooops! Looks like Roger beat me to it. The 'wings' aren't for flying. They enclosed it's feeding apparatus, known as a lophophore. The 'wings' aren't for flying. You know I'm going to have to retract this part. I would be surprised if selective pressures to inhabit places with the current to feed in without being buried by it didn't produce a shape that provided a certain amount of lift. On a very limited scale I bet they did fly ! "Delabole Butterfly" is an old quarryman's name for the very similar Cyrtospirifer verneuli from Cornwall, usually found flattened. 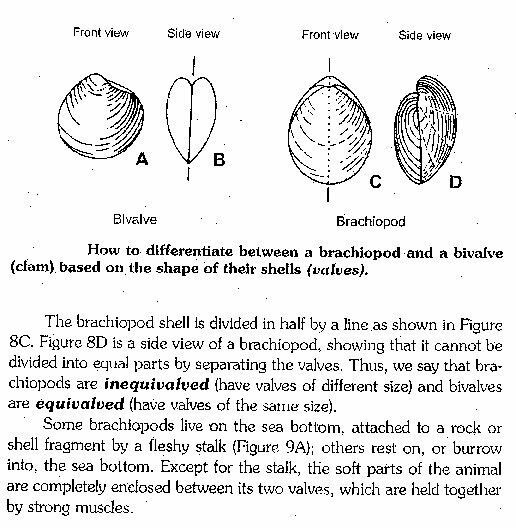 I am trying to learn how to tell an internal mold of a brachiopod from an external cast. I have some brachiopods that are free from the matrix but only one valve and, like a bivalve, they have ornamentation outside but a smooth inside surface but can have internal features preserved. How do you know this is an internal mold without seeing the other side? Could any possible growth lines just be worn off? I think the lack of any real ornamentation, along with the slight gap around the fossil, and the indents from the hinge teeth at the hinge line, all point to it being an internal mold. I know what 'snail' is thinking but of course you guys gave the right reply anyway.. If it were a clam, you'd be right in interpreting the fold to go down the middle, in this pic. The hinge is actually along the straight edge at the top. As for 'mold', I think you can kind of tell a mold just by the look of it, but one of the giveaways that I have noticed for brach's is those two little holes/slots in the rock near the 'beak'. I would say it is an internal mold (underside) of a dorsal valve of a Mucrospirifer mucronatus. Maybe other examples of other specimens from the same matrix could reveal more details. How do you know this is an internal mold without seeing the other side? Could any possible growth lines just be worn off? Here's a picture of the interior showing the location of the hinge teeth.